Home » Blogs » 7GenGames » 7 Day Summer Sale Starts Today! Now that it’s officially June, it’s finally starting to feel like summer. For teachers, summer might mean finally getting to go on vacation, but it probably also means preparing for the next school year. For parents, it might mean finally getting to go on that family hike or trip to the zoo now that the kids are out of school, but it probably also means having to find ways to entertain your kids. Our games can help with both teachers’ and parents’ summer concerns. For teachers, our games can help you prepare for the next school year because they’re a resource for teaching math and social studies that includes automated grading, pre- and post-tests, teacher resources and, professional development. Our games can help parents entertain their kids over the summer, because 7 Generation Games is a fun activity that keeps kids occupied while actually making them smarter (rather than say mindless YouTube videos that you’re sure are killing their brain cells). 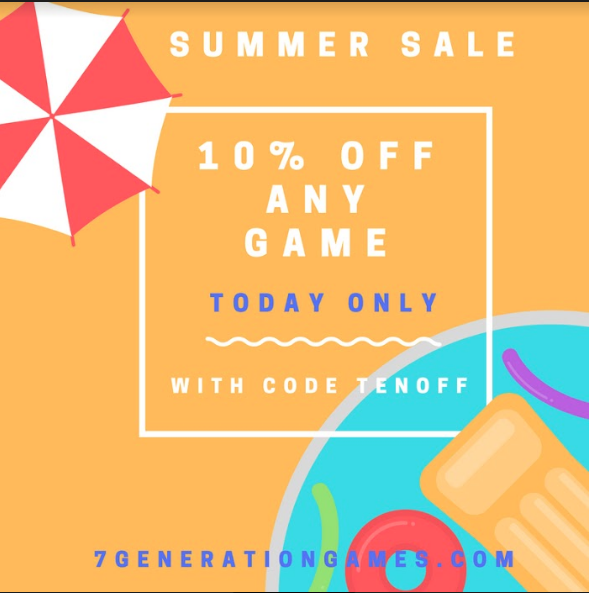 Starting today, you can get our games for a discounted price, because, for 7 Generation Games, summer means having our first ever 7 Day Summer Sale! After all, what a better way to celebrate the start of summer than having a summer sale? Each day we will be releasing a new deal on Facebook, Twitter, and Instagram that will expire after 24 hours. We are kicking off today’s deal with 10% off any game using the code TENOFF. Get your discounted game here! Don’t know any kids or students who need our games? We do. Donate a game to a student in need here. 7 Day Summer Sale deals also apply to donated games.